Thank you to our friends, WFMZ, for covering this story! 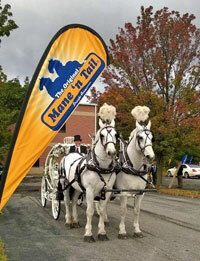 Photo on right, Mane ‘n Tail user, Bee Tree Trail, brought their horse drawn Cinderella carriage to the groundbreaking ceremony. A Northampton County company that makes shampoos and personal care products is expanding its business. Straight Arrow Products, maker of Mane ‘n Tail, held a groundbreaking ceremony Thursday afternoon for its new manufacturing plant in Forks Township. The company plans to renovate and expand the building that’s already on the property. Officials said new jobs will be added, but it’s not clear how many. Mane ‘n Tail also has a facility on Highland Avenue in Bethlehem Township.